In future new information will be only actualized on this new web site. The OC is still working on the transfer process. Please make your comments and recommendations to the OC about missing information on the new web site. The RoboCup Logistics League (RCLL) is a league of the annual international robotics competition RoboCup. It focuses on in-factory logistics applications. 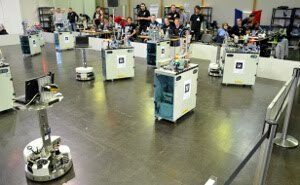 Following the RoboCup spirit this league’s objective is to enable scientific work in order to achieve a flexible solution of material and informational flow within industrial production using coordinated teams of autonomous mobile robots. The task of the robots is to fetch raw materials from an input storage, transport them in a dynamic sequences between machines, handling production at these machines, and finally deliver them. A team consists of three robots. Each robot builds on the standardized Festo Robotino robot platform which can be extended with sensors and computing devices. In 2015 the league introduced a new challenge. Instead of moving pucks on the floor as in previous years, the robot now operate stations based on the Modular Production System (MPS) provided by Festo (see image on the left). MPSs are small production machines that process small cylinders. These cylinders represent workpieces and consist of a colored base, zero, or up to three colored rings, and a cap on top. These cylinders embody products within the factory scenario. By the physical manipulation of these products, the material flow and the production sequence of the goods become comprehensible. The products ordered are determined randomly and published dynamically along the game. Therefore, planning and scheduling of the production process driven by the robot fleet are crucial aspects of this scenario alongside the typical problems in robotics like navigation with collision avoidance, self-localization, object detection, or (limited) manipulation.